Take I-35 E southbound to I-94. Take I-94 West exit (merging left after exit). Proceed about 1/2 mile, then take exit 241A / Marion St. # On exit ramp, move into farthest right-hand lane, turn right on Marion St. At third stop light (Rice St) turn left. * At second stop light (Atwater St) trun left. Go 2 1/2 blocks. Church and hall are on the right (corner of Woodbridge and Atwater Sts); park in Northern States Power parking lot across the street. Follow I-94 East; take exit 241A / Marion St. Turn left on Marion. At fourth Stop light (Rice St) turn left. See * above. Follow I-94 West; take exit 241A / Marion St. See # above. Follow 35 E north; Take Kellogg Blvd exit, turn left at stop light, cross John Ireland Blvd, then the roaad curves 90 degrees right and becomes Marion St. At fourth stop light (Rice St) turn left. See * above. Servies are in English and Romanian. 5:00 PM Vespers. Confessions are heard before and after Vespers. 10:00 AM Divine Liturgy, followed by Church school. From August 1-15, svery evening inclusive, 7:00 PM Paraklesis o the Most Holy Theotokos. Please call the parish office at 651-488-5669 for schedule of other services. 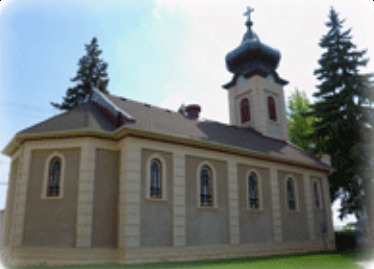 The history of St Mary’s Romanian Orthodox Church in St Paul began about the year 1910. Like other ethnic immigrant groups, Romanians arrived in a land of strange customs and new life styles. On May 18, 1913, less than three years after its formation, the benefit society “Augustina” voted to establish a parish with the name “Biserica Greco-Orientala Orthodoxa Romana Sfanta Maria,” and the concept of a St Mary’s Romanian Orthodox Church of St Paul, MN was started. On November 9, 1913, the hard working committee had transacted for land on which to build a church, and on June 14, 1914, the cornerstone was laid. The blessing of the new church ook place on October 15, 1914. Originally, the church was blessed by Fr Podea. However, it was not officially consecrated until 1935 by the first Bishop from Romania, His Grace, Bishop Policarp Morusca. As part of the consecration service, religious relics and earth from Romania were instilled in a part of the Holy Altar Table. During all the years the constant activity and growth of the parish can be attributed to the spirit and deep religious convictions of the people of the church. The accomplishments of a small number of people (the parish probably never exceeded 150) are a constant reminder of how God works His Will through the faithful. It is our hope that the good spirit will continue to dominate the hearts of the church members in the future and perpetuate and improve their Orthodox faith. During 85 years of existence, the parish was served by about 28 priests. Services are held in English and Romanian. All people of the Orthodox Faith are wholeheartedly welcome to attend.